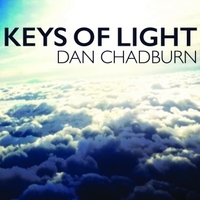 My introduction to Dan Chadburn was the title track off his new album Keys of Light. I featured the track on one of our sites (RateThe Tracks). What happened while listening to that song turned into quite an eventful experience. I was feeling so sad that my little girl was all grown up, and had left home. What I realized after I had shed my tears was how healing that was to be able to feel those powerful emotions then let the music take me and heal my soul. Great music carries a message with it however creating instrumental music is more difficult for people to find something that moves them. I have heard some amazing music this year and that is my honor and privilege to do so. This is why I can appreciate and respect incredibly talented artists like Dan Chadburn. The keyboards and orchestrations throughout Keys of Light are like a soundtrack to heaven. If this is the kind of bliss that awaits us after we leave our bodies and become pure light then we are in for an amazing journey ahead. This is music for the living and it will make you feel so many things, and it can be very healing if you want to take the time to listen to it all. I normally like to point to three key tracks but in this case I feel that would not be fair. Each track leads the next down a different path and they are all connected. Every track is extremely strong with a different pace and texture that creates moods and atmospheres that I can see fitting into a motion picture or narrated visual. Music such as this has a multitude of uses and that makes it invaluable. It was a pleasure to discover the music of Dan Chadburn and his work of art on this musical canvas called Keys of Light. It certainly was a bright spot in my day to listen to this music. Yes it will bring many thoughts and emotions upon you but you will also have an opportunity to process those feelings then move on. You have to feel before you can heal and this music is the perfect place to start.